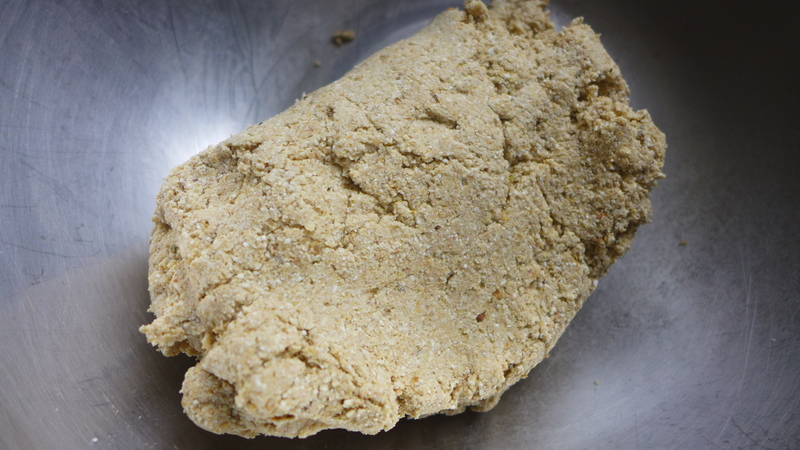 Yesterday I showed you how to make sprouted buckwheat flour. Today, I will give you an idea of what to do with it. 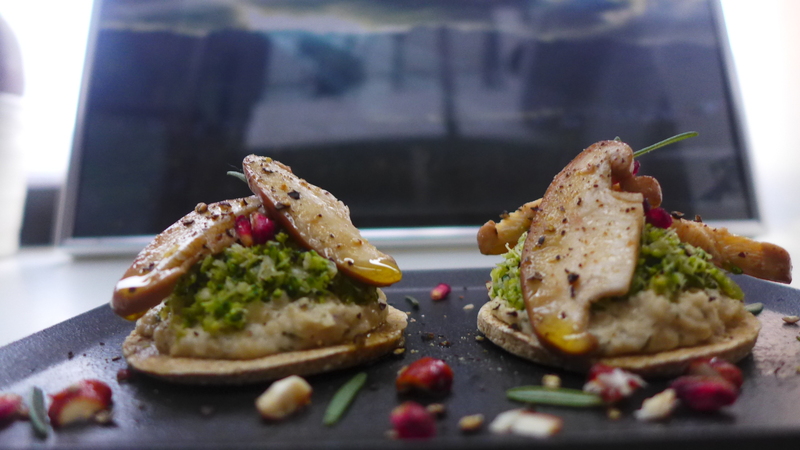 The picture above is a mushroom, dill cheese & broccoli Blini, of which the base is made of buckwheat flour. I am delighted with the mouthfeel. It behaves like a conventional shortcrust pastry, which is divine. Dehydrate for about 4 – 5 hours then remove. You don’t want them to crack and get all bendy and dry. You want a bit of moisture in the centre. Next, the cheese. This is a simple cheese, no fermentation or culturing. Blend till smooth. Set aside. Slice the florets off the head, as close to the florets as possible. 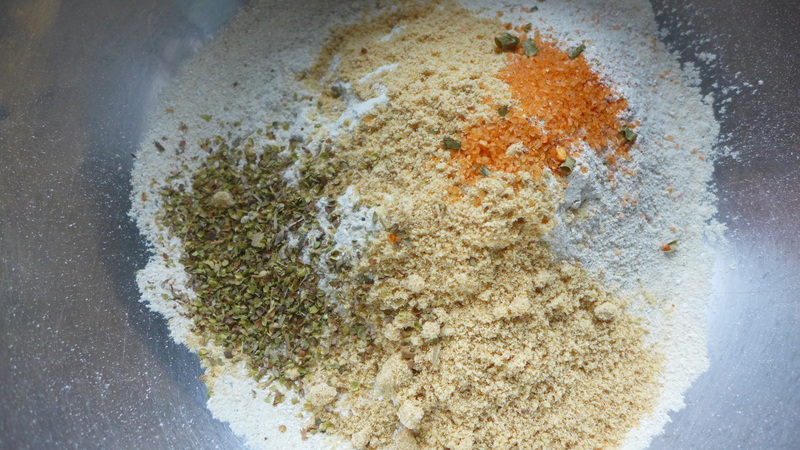 Wash in hot water and drain then blitz until it resembles crumbs as in the picture below. 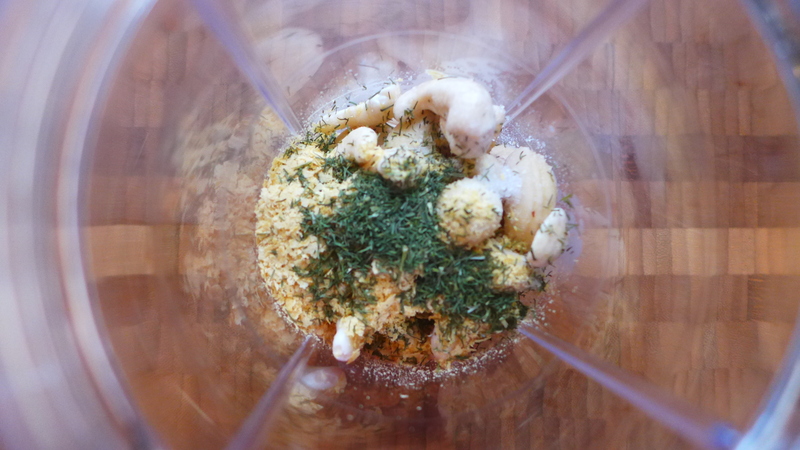 In a small blender, add the minced clove of garlic, red wine vinegar, water, salt and pepper and blend. 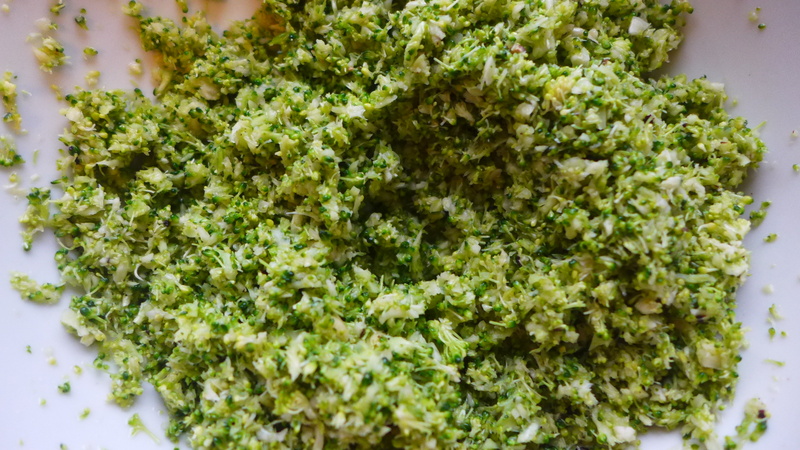 Slowly add the oil in until the dressing is emulsified.Pour this dressing over the broccoli and set aside. Wipe the mushrooms with a paper towel. Slice the stems off then slice the mushrooms into thin slices. 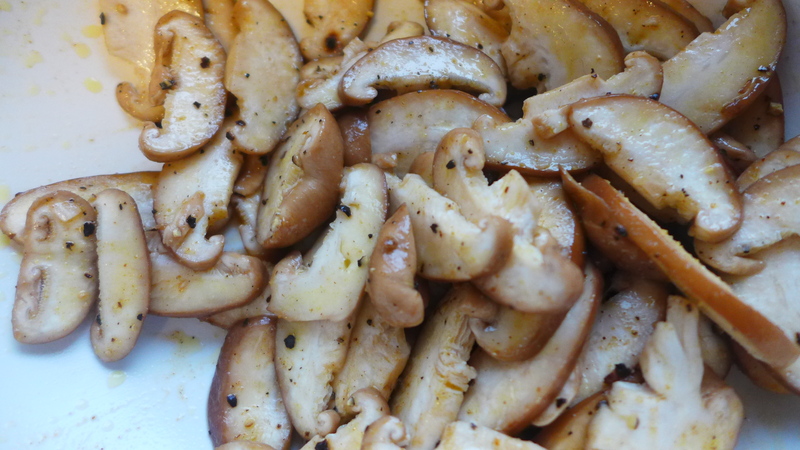 In a separate bowl, whisk the dressing ingredients together then add it to the mushrooms and mix well. Set Aside. 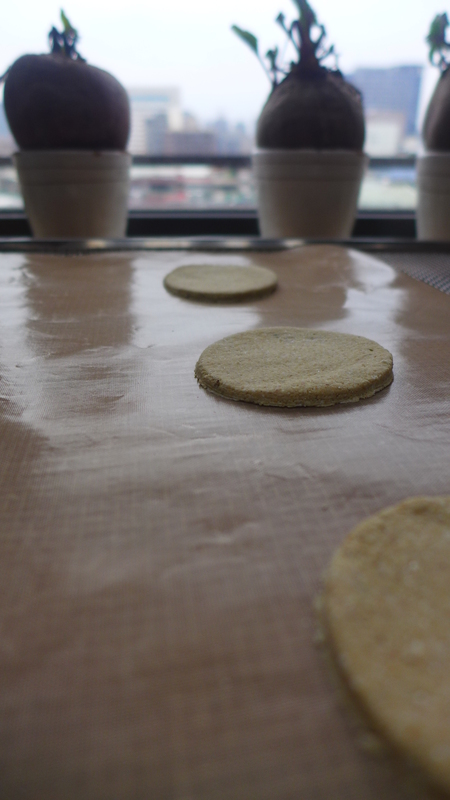 Place two blini bases on a plate. Add a healthy dollop of dill cheese and make as level as possible but not flat. Add a mound of broccoli. Don’t press this layer flat, now you want height. Take three pieces of mushroom and lay them on top of the broccoli. Add some dried pomegranate seeds. Dress the plate in chopped, candied almonds, sprigs of rosemary, cracked black pepper and a few drops of olive oil on top of each blini. 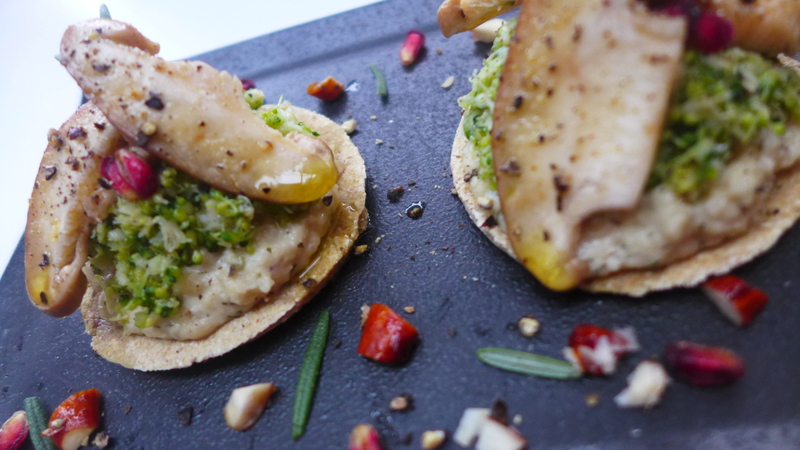 This entry was posted in Raw Food and tagged broccoli, buckwheat, buckwheat flour, dill, dill cheese, easy raw food, flax oil, healthy living, mushrooms, raw canape, raw food Taipei, raw vegan blini, red wine vinegar, simple raw blini base, tree nut cheese by Chef Prish. Bookmark the permalink.